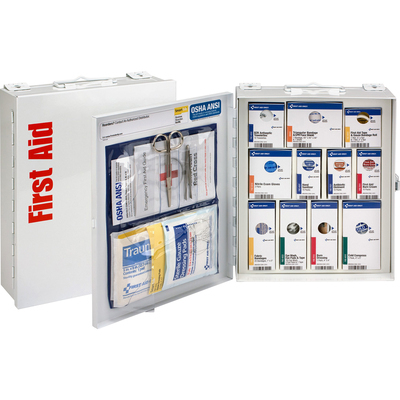 Class A, 94-Piece, Smartcompliance First Aid Cabinet Without Medications Sufficiently Treats 25 Or More People. Customizable Cabinet Is Easy To Use, Easy To Restock And Eliminates Disorganized Supplies. Solid Steel Case Features A Carrying Handle For Quick, Simple Transportation To The Injured Person. Plus, The Case Is Wall-Mountable To Keep It Conveniently Displayed In An Easy-To-Access Location. First Aid Contents Exceed The 2015 Ansi Class A Requirements. Type 1 And 2 First Aid Kit Includes Triangular Bandage, Cpr Mask, First Aid Guide, Fabric Bandages, Bzk Antiseptic Towelettes, Hand Sanitizer Packets, Trauma Pads, Cold Pack, Nitrile Exam Gloves, Eye Pads, Eyewash, Tape Roll, First Aid Tape, Burn Cream Packets, Burn Dressing, Antibiotic Ointment Packets, Forceps And Scissors..
Class A, 94-Piece, Smartcompliance First Aid Cabinet Without Medications Sufficiently Treats 25 Or More People. Customizable Cabinet Is Easy To Use, Easy To Restock And Eliminates Disorganized Supplies. Solid Steel Case Features A Carrying Handle For Quick, Simple Transportation To The Injured Person. Plus, The Case Is Wall-Mountable To Keep It Conveniently Displayed In An Easy-To-Access Location. First Aid Contents Exceed The 2015 Ansi Class A Requirements. Type 1 And 2 First Aid Kit Includes Triangular Bandage, Cpr Mask, First Aid Guide, Fabric Bandages, Bzk Antiseptic Towelettes, Hand Sanitizer Packets, Trauma Pads, Cold Pack, Nitrile Exam Gloves, Eye Pads, Eyewash, Tape Roll, First Aid Tape, Burn Cream Packets, Burn Dressing, Antibiotic Ointment Packets, Forceps And Scissors. 1 x FAE-6012: Cold Pack, 4" x 5"
1 x FAE-7012: Burn Dressing, 4" x 4"